The more frequent readers of this blog, “Masako and Spam Musubi”, likely see that my main focus is on World War II and my family’s involvement on both sides of the Pacific. Although I definitely am not a historian by any means, stories here are based on family records supplemented by tidbits of historical “facts”. And some of these historical facts are public knowledge…while some are kept or suppressed from public knowledge. The White House also has perhaps the most insurmountable power over what is written – or how events are presented to or withheld from the public. At times, this leads to the distrust of the very government the people have elected into power. This distrust continues today and arguably, the worst its been in our country’s history. This is a knotty topic without a doubt…about FDR’s involvement – or even orchestration – in what happened during these critical years. But these factual conflicts have perplexed me for years. Conflicts between what we were taught versus what wasn’t. I wish to express some facts here and in the next couple of stories about the Pacific war and allow you to come to your own conclusions about FDR. They will center around Pearl Harbor and the interment of my dad’s family in “war relocation centers”. Please note that entire books and research papers have been written on this general topic so my blog will do as best possible to reveal the facts involving FDR – before Pearl Harbor, immediately after and up to his death late in the war. 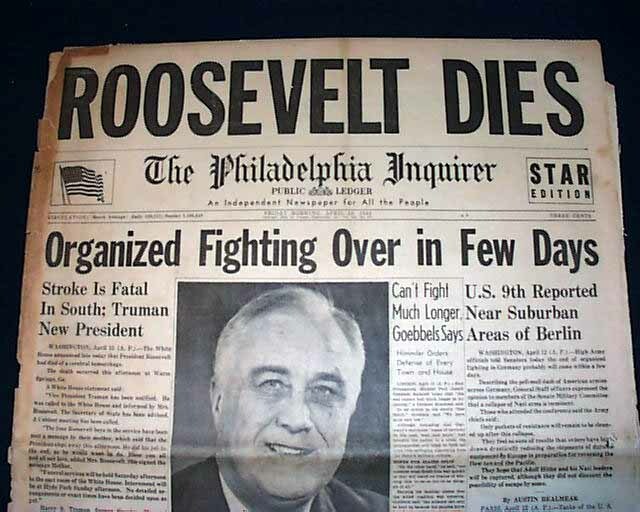 So… What did FDR know? FDR was liked by a significant majority of Americans as proven by his being elected to a fourth term. A pre-war Gallup poll disclosed 88% of those Americans polled opposed US involvement in the European war. Britain was fighting for her life. FDR supported isolationism publicly. Beginning in 1940 and then continuing, FDR and the League of Nations placed an economic embargo on Japan in reaction to their attacks in Asia. Items were added weekly to the embargo list – except for oil. FDR authorized British and American military staff members to meet during January through March 1941; the purpose was to plan ahead military strategy in the event the U.S. entered war against Germany. They determined that Germany was to be first defeated, while the U.S. would stand on the defensive toward Japan in the Pacific. The Lend-Lease Bill was passed in March 1941, a major shift in FDR’s foreign policy. On November 29th, Secretary of State Cordell Hull secretly met with newspaper reporter Joseph Leib. Hull knew him and felt he was a news man he could trust. The Secretary of State handed him secret MAGIC copies concerning Pearl Harbor. Hull told him the Japanese were planning to strike Pearl Harbor and that FDR planned to let it happen. Due to the incredibility, only one newspaper published the story. (L to R) Stimson, Oshima greeting Hitler, and Ranneft (in white) shaking hands with Chester Nimitz, 1946. ♦ The shootdown of Admiral Yamamoto. The above tries to give you an at altitude look down on what was happening prior to the attack on Pearl Harbor. In the ensuing stories, I hope to present “things to think about”… Things like secret codes, espionage, internment and even D-Day in a roundabout way. Things that FDR knew then orchestrated actions as a politician should. I hope you will stay tuned… then come to your own conclusions as to what FDR knew. To be continued… Part 2 is here. (2) There were several codes being used by the Japanese Army and Navy in addition to the diplomatic code mentioned above. All were broken by US cryptologists. The Japanese also had their cryptologists but were nowhere’s near as successful in breaking US or British codes. (3) It is important to note that CHAMBERLAIN was the Prime Minister of England, not Churchill. Yet, FDR and Churchill were secretly making promises unbeknownst to Chamberlain. (4) Source: Henry Lewis Stimson diaries. Very interesting… Looking for more. Thank you, Pierre. I’m not as good as you but I’ll get there. I really enjoyed that post. If you google “FDR’s scandal page” the resulting web sites are endless! His climb to power was a family tradition of deceit. Agreed…with Eleanor fed up quietly at his side for love of country. Eleanor? Quiet? No only she did she carry on her own affairs, she was basically our first woman president. Very true! What I was inferring was she was a strong woman to keep her thoughts largely to herself in public (like about his girl friend or that they stayed in different rooms at the White House) for the sake of her country. Yes, she kept quiet about his affairs, lest he speak about hers. And people today think that corrupt politicians are a NEW thing!!?!! Those 2 knew knew all the tricks. Indeed… but unlike today, when we Americans “hear” of Monica or that a president smoked pot, many apparently condone it. Yup, they knew all the tricks and in a bad way… It leads to fraud and deceit. I’m waiting for more. Though this was certainly a lot to digest…. NO MORE ICE CREAM! But yeah, this was a lot Koji. I had no idea. We sure as hell were pleased you did join the fray. Suspect is was always when rather than if. I always marvel at how the Colonies came to the aid of Mother England! And indeed, it was “always”. I will be posting another history segment on this soon. Thank goodness they did. Looking forward to more. As much as you were connected to or part of government, my respect for government now has plummeted measurably. They need to get back down from the stratosphere and breathe the same air we do. You may know most of what I am going to report but it is nevertheless fascinating…although MILLIONS died. Some of this I already knew, so I am looking forward to more information you write about. This is the history we are not taught – the truth! You have done quite a bit of research – good job. Gee, Pierre… Merci beaucoup once again! This is a great history lesson. You’ve cited all very good sources. But, try to bare in mind that some of what these sources claim, simply doesn’t add up in 1941. For example, that one about the position of the Japanese strike force; total fantasy. No Navy on earth at that time, considered it physically possible to make a crossing of the Pacific by a fleet of ships, without that fleet pulling in port somewhere along the way, not even the IJN. And, there was also nothing available at that time to track fleet movements once out of aircraft range of land, except for another ship, which would have been spotted and sunk by the Japanese, or they would have turned back if too early in the voyage. U.S. submarines weren’t operating in that part of the Pacific and did not have the range to go all the way to Japan, and then back, shadowing the Japanese. Even if they did, they had no way to report it from that far out. There were no codes of Japanese task force ships to break, because that fleet went into 100% radio silence once they left Japanese waters and maintained that silence until the attack commenced. FDR/Churchill before the war: Churchill became Prime Minister in June 1940, right after Paris fell, but before France surrendered. So, he was very much in charge when the secret communications were exchanged and the meetings between U.S. & British military staffers took place. Neither of which were about planning for U.S. entry into the war, but rather the aftermath of a German invasion & occupation of Britain and/or possible British surrender. Britain’s Parliament between August 1940 and June 1941, very nearly voted Churchill out on several occasions for the sole purpose of ending the war on Germany’s terms. Lastly, the quote from Stimson: He may have said it, but he’s a liar if he did…lol Now, the reason he would lie and the reason in fact for all the theories about what FDR knew or did not know about Pearl Harbor is a very simple one… they’re all covering up the fact that the Almighty Roosevelt simply screwed up. He was obsessed with Germany (for good reason) but, was not interested in what Japan was doing unless it was directly related to Germany. Even after Pearl Harbor, he treated the Pacific Theater like a red-headed step child. Hey, Kevin, thank you for your good comments and observations. My goal of this sequence of posts on “What Did FDR Know” is precisely what you wrote – for each reader to come to his or her conclusion. They are, of course, free to do their own detailed research on a topic to their own satisfaction. Yup. Agree with all of it. No one thought Japan (or anyone at the time) had the ability to project that much power over that kind of distance. As I said elsewhere, when you know the result, it’s easy to cherry pick the “evidence” leading up to it. I’m late in starting to read your FDR posts, Koji. (Been busy with my haiku!) But, the great thing about that is, I don’t have to wait to read the next one! This is fascinating information, and I look forward to following the rest of the story. Thank you for all the work you’ve put into this very interesting series, Koji! No, I haven’t seen that book before, Jan. I did peek at the TOC and noticed chapters on the first Thanksgiving and Christopher Columbus. I think I’ll pick one up. Hope you like it, Koji. Let me know what you think. Fascinating; I’m really interested in the politics of war and peace. So many things kept hidden from the public. Neither do I! New Zealand is consistently found to be one of the least corrupt countries in the world, yet still we seem to have frequent scandals involving our politicians in dirty dealing. If we’re not considered corrupt – it must be REALLY bad in other countries. Not sure elected officials are that much different than ever; it’s just that we know a lot more now than, say, our grandparents. Who knew at the time that LBJ was lying about Turner Joy, etc?